Did you ever play Lemmings, and think, these incompetent assholes need a range of ludicrous weapons to wage war with? Well, that is what Worms is. 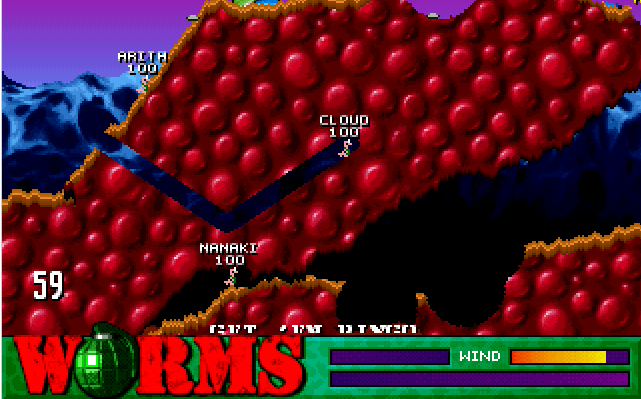 Lemmings, crossed with Cannon Fodder, and like in Cannon Fodder, you die… A LOT. I first played this game on the PlayStation in the late 90’s, me and my mates played it on the slightly clunky PS1 version, and would spend hours failing to hit each other with the bazooka, and resorting to homing missiles, airstrikes, and ninja ropes! The premise is fairly simple. You play in a death match against between 1 and 3 enemy teams (all can be human). You take it in turns, controlling 1 worm at a time using the aforementioned ludicrous weaponry (SHEEP BOMB!!! ), in an attempt to be the last surviving team. Each team has a theme, and each team has a certain level of competence when it comes to using the weapons. Take This, yeah, they named after the boy band Take That… are my arch nemesis. I can’t beat them! It is annoying as hell. Gary freaking Barlow is a whizz with a rocket launcher! AT the other end of the scale you get “Teddies”, these include Winnie the Pooh, and my god he is POO! This guy commits Hari Kari on a turnly basis! Each team, is taken from famous groups of 4, or (at the time) pop culture references. The “Cool Cars” is a particularity dated homage to crap looking early 90’s sports cars. The “Royalty” team has Princess Diana… As well as “Fab Four”, (Yep, the Beatles make an appearance!) “Waterloo” (Abba) and the developers “Team 17”, who sadly were not the members of East 17. As I mentioned, you take it in turns, so this allows for a 4 player hot seat match. If you have have one of these, they are SOOOO FUN! You can gang up on people, or like me… TUNNEL! I used to be awesome, and i used to be able to pin point shot people with the bazooka, but now, I like to play “dark side” tactics. One niggle I have, is the erratic AI. They will make some very bizarre choices, I have seen worms turn around, face a wall and fire a bazooka to kill themselves. Or, more commonly, I you see a worm shoot a Bazooka pixel perfect over and round a wall, so that it lands perfectly on your little worms head doing the full possible maximum damage. Other than that, the game is well balanced! There is also a fiendishly hard challenge mode, which again has a few pop culture references. For example, the 2nd or 3rd level tasks you with punishing some “soap starts who are making music”, cue you murdering (with extreme prejudice) Robson and Jerome. I am not sure our you younger readers will get some of the jokes, so luckily, it comes with an editor. The Player 1-4 teams have generic names, so… I have an FF7 team (pictured above), a Black Moon Rising team (my Band), and the obligatory “Wangs” Where they are all pet names for genitalia! You can change the voices of the worms (about 8 different voices), change the gravestones (Cannon Fodder influence? ), and state if they are a human controlled team, or AI. I loved Worms, who didn’t? It was humorous, witty, and involved a surprising amount of skill to master things like the power/wind for the perfect bazooka shot, or your ninja rope, to quickly traverse the terrain. While the game is fun, and still plays well. It is let down by a lack of proper networked multiplayer (on the versions I have), the AI can be a little erratic, these are small niggles, but they do stop it being a high 80s score. Pros: Hours of fun, stupid weaponry, you take great pleasure in murdering the Queen. This was THE game that would always be put on when me and my mates were having a night in at one of our houses with a few bottles of beer bought from the one shop that would serve us. I still consider this the best party game you can play without Wii/Kinect/etc. I havce had several versions of the game over the years including PSP and X-Box 360 versions. I am not overly keen on the 3D version it just doesn’t seem right. The 3d versions just didn’t work. When I was a kid, we spent almost every night playing this on the ps1 version, and the only thing that ever came close to matching it for this kind of multiplayer was Mario Party. 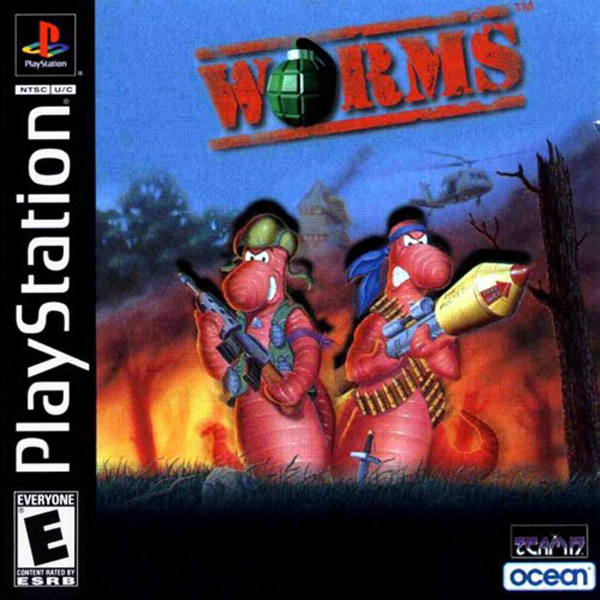 I say Worms 3D didn’t work but I loved a game called “Hogs of War” which was in-effect Worms 3D. Just watched a Hogs of War video, had never seen it before. I remember seeing the case in shops. Will have to track down a copy! Cool, will keep an eye out for it!